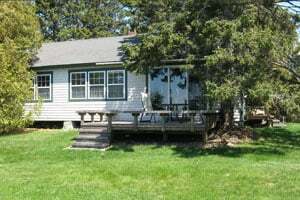 Cedarledge Cottage is a waterfront cottage with two bedrooms, living room/dining area, fully equipped kitchen and full bath as well as a large deck with comfortable seating to enjoy the spectacular views of Blue Hill Bay. Bedrooms include one queen-sized bed and the other two twins. This cottage accommodates 4 people. 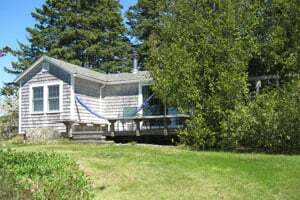 Pinelodge Cottage is a waterfront cottage with two bedrooms, living room/dining area, fully equipped kitchen and newly renovated bath with shower, as well as a large deck with comfortable seating to enjoy the spectacular views of Blue Hill Bay. Bedrooms include one queen bed and the other two twins. Great location, quality and great value on Mt. 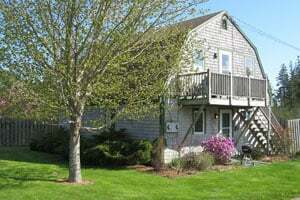 Desert Island, Aldernest Cottage is an affordable option for you. We are located on the western side of Mount Desert Island, locally known as the “quiet side”. Adjoining our lovely cottages overlooking Blue Hill Bay, Aldernest shares 7 acres with a westerly orientation for beautiful sunsets over Blue Hill Bay. 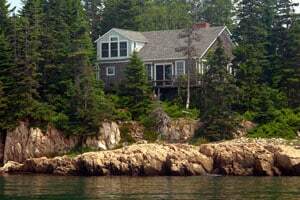 The rocky shorefront of Maine is just a short walk across the lawn so you can have your coffee in the morning sitting on the rocks while you enjoy the quiet, peaceful setting. Each unit accommodates 4 people and are often rented together by a family group looking to accommodate up to 8. Paul’s Cottage is the year-round home where my father-in-law spent his retirement years. Built to resemble a New England barn, the spacious pine-paneled living room features a cathedral ceiling and a granite fireplace that is likely the largest you have ever seen! 3 Bedrooms – First floor queen bedroom with full bath. Above the kitchen is a private loft and dormer with queen bedroom, private bath with stall shower and adjoining sitting room with a twin bed for a 5th guest. Paul’s cottage accommodates 5 people.